There was a popular abbreviation in Soviet Union CATF – ‘closed administrative-territorial formation’. The cities, in which there were strategically important objects of the military-industrial complex, were designated in this way. Outsiders had no possibility to get there. After USSR collapse the meaning of ‘closed cities’ disappeared in Ukraine. But after a quarter of century, in connection with conducting of the Anti-Terrorist Operation, CATF appeared once again. Informator.media figured out how such isolated from the outside world settlements live. The tiny village of Peschanoye, Stanichno-Lugansky district, is located practically on the shores of the Seversky Donets, which in these places serves as a natural ‘border’ between the territories controlled by Ukraine and the occupied lands. The dirt road to the village also passes very close to the river. In some places – very close. One big international humanitarian organization forbade its employees not so long to visit Peschanoe, considering it too dangerous. The biggest part of other organizations have never got to here. At the entrance to the village there is a barrier, to which a military man is assigned, who lets only local people go into the village. But they already twice had problems with entry and exit from their native village. ‘We brought to military the lists of inhabitants, car numbers – we have only six here. But, after a month, on January 20, 2017, they said to us not to leave this place at all. But how it could be possible? We have only houses, wood and cemetery here. We can go by car only to graveyard, – the main local activist Nina Solomakhina gloomily joking. – They didn’t tell us, what’s motivated this, why I can’t go to buy a loaf of bread, a pill from the head. But I understand that there was more than an order that someone didn’t understand’. 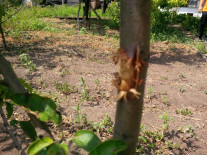 Residents tried to solve this problem with help of the chairman of the Nizhneteplyovskiy Village Council, the commandant of the Police of Schastie. But only the district police from Petropavlovka helped. He just came and talked with the military, after which the residents again began to be missed. The situation repeated after a month. ‘We solved this problem once again’, inhabitants say without details. Peschanoe was a holiday village before a war. Population census in far 2001 fixed that 20 people live there. About the same number is available now. Of the nearly seven dozen houses, people now live only in eighteen. Vera Chizh the Doctor of Economic Sciences. She was a Head of the Department of Accounting and Audit at the East Ukrainian National University named by Dahl. 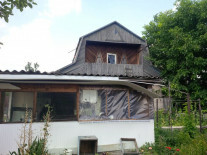 She wasn’t able to remove with her university in Severodonetsk – it was expensive to rent a flat in new regional center. But last year she signed a five-year contract with the Cherkassy State Technological University. ‘A month-month and a half I practice then I come here for a week or two’, Vera Ivanovna tells. She lives in student hostel in Cherkassy. Vera Chizh is 63 years old. She continues to work in spite of she retired. But, the biggest part of pensioners live only for pension payment and they have permanent problems with getting of them. The biggest part of those who live there are registered as IDPs in other settlements. Also humanitarian aid and vegetables with fruits of what they have grown in their own garden help people to survive there. Four residents of Peschanoe haven’t reach the retire age yet. But they can’t find a work. They live only at at the expense of the humanitarian aid, the kitchen garden and, as they say, ‘the help of friends’. But the humanitarian aid had already fallen down from this ‘package of surviving’. Red Cross, regularly delivered to people food and hygiene kits, has stopped this aid from the September. ‘They said: ‘We want you not to be dependent on humanitarian organizations, but try to produce surpluses and sell them’. But who will buy it? Everyone has own kitchen garden here and six kilometers to a closer market, where the same village area is. Plus we have sand here. With such a weather, which was this year, when there is 40 °C at day and 10 °C at night, to grow something is a feat’, Vera Chizh is sure. ‘Zolote welcomes you. Zolote is Ukraine’. Such inscription in Ukrainian might meet people, crossing the checkpoint ‘Zolote’. But because ‘LPR authorities’ sabotaged an opening of the first automobile checkpoint in Luhansk region, it hasn’t started a work yet. 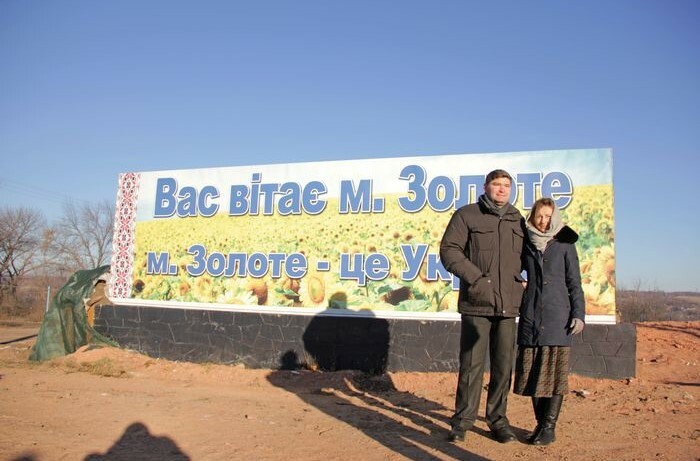 That’s why Zolote-4 (people call it Rodina) and Katerinovka village (is part of the Zolote City Council) inhabitants see this welcome poster now. If checkpoint was removed on 350 meters forward, hundreds of residents of controlled areas wouldn’t be necessary to cross every day a well-equipped and absolutely empty checkpoint ‘Zolote’. ‘The only left is to enclose with barbed wire this Rodina and let nobody in’, local female, trading vegetables in the local market, boils over. Her disturbance is connected with new checkpoint’s mode of operation. Now it will be opened not from 6, but from 7 am. Most of all changes affect ‘Zolote’ mine, which is located in another part of the city – in the village of Stakhanovets. ‘Mine doesn’t know about what morning-day-morning are, it works 24 hours! 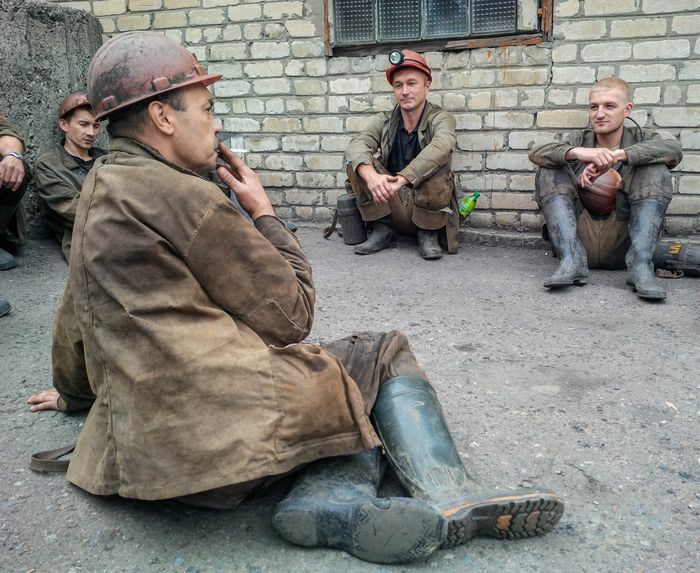 If they don’t pass at night, so the need to change mode of operation will appear – a person will work not 6, but 12 hours’, deputy director of a coal enterprise Andrei Mischenko suggests. According to his words, the authority of the mine applied to Zolote executive committee, but they only send them blanks, which must be filled. Military promised to look on the lists and decide if they pass mine staff. We don’t have an aisle on Pervomaisk. What is the goal of this checkpoint? To check us, Ukrainians? We don’t understand this, – Mischenko outrages. – There were less problems in time of war!’. A new skip regime affected about one hundred employees of the mine – almost a quarter of the staff. The innovation will touch even those who work only in the first shift – they should be in place already at 6:50, ie, 10 minutes before the opening. 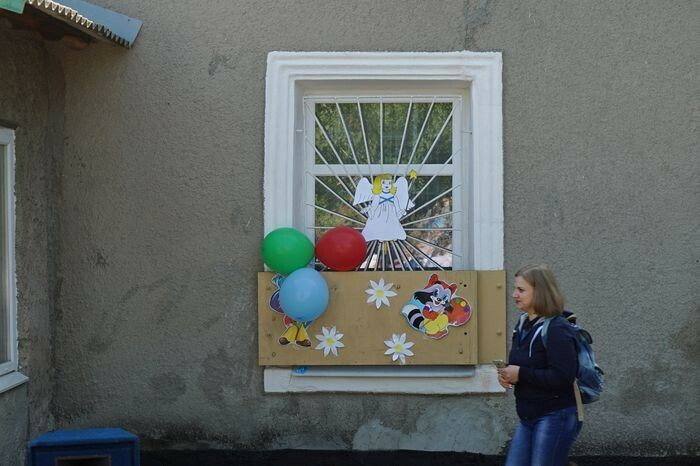 There is a school in Zolote-4, in which children go not only from the village of Rodina, but also from other parts of Zolote. But underaged can’t cross checkpoints alone – they must be accompanied by one of the parents. ‘I live on partizanskaya street, it’s the outskirt of Rodina, where two 4-storey houses are. We have last post there. Only 10-15 minutes to school and our kid is adult enough, but I need to see off and meet him every day’, Galya complains. One more problem village of Zolote is Khutor. The enter there is allowed strictly on the lists. Even the ownership of real estate doesn’t matter. 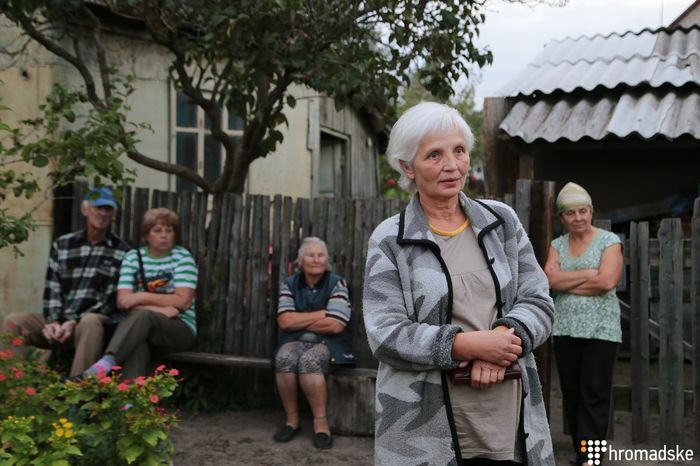 ‘We have a house there, but we are not allowed to go there’, complains Olga Yaroslavovna. It’s hard for the inhabitant of Khutor Elena to answer on a question how relatives can visit her – some kind like since the beginning of the war, she hasn’t seen anyone else in the village and hasn’t even tried to put someone there herself. ‘I bring my child to school every day. Half an hour is needed to get there. We get documents: passport and birth certificate. The military is looking for a residence permit. Write down names, and we pass through’, Elena tells. 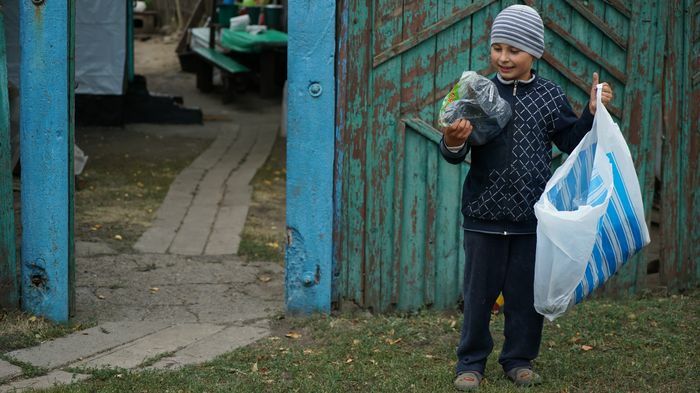 One more settlement out of checkpoint ‘Zolote’ is Katerinovka. Nearly 300 people live in it and dozen with half of them are children. No one from them studies at school in the village of Rodina. Schoolbus every day takes kids. 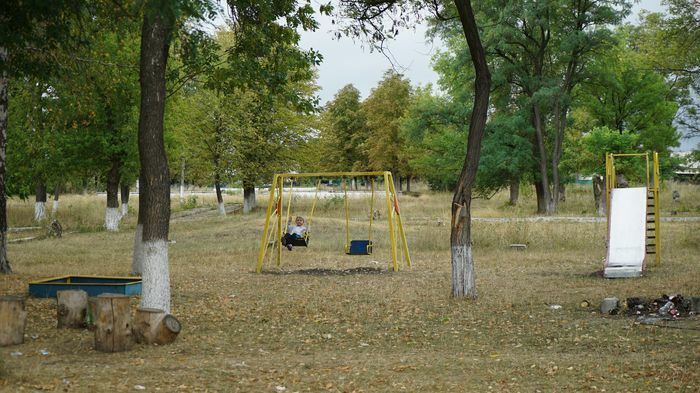 But it waits for children out of checkpoint, up to which – 3 km from the center of the village. The most extreme part of Katerinovka is called Kashanovka. Less than 10 people live in it. There are no any block posts on the road from Katerinovka to Kashanovka – only Ukrainian military’s positions. ‘Do you understand where are you?’, military cried, who, it seems, applied not to us, but was expressing his wonder in connection with ‘alien’ appearance. After the long explanations on the topic ‘who, where and what for’ we are passed. Elderly man and woman show their yard to us, together with the collection of irons flown down to them. The shellings here happen almost every night. But locals don’t perceive them as part of a real war. ‘It’s Hollywood. If they shoot here, they will get an answer. That’s why they imitate attack on themselves’, local told us, knowing the subject. On a question if they going to leave, he answer the next: ‘We will be here as long as we can hold out. Sometimes nerves can not stand it. We already left for three months, but then we decided to come back’. After two hours after we left, the strong shelling had begun. Man was lying in the kitchen garden with face buried in the ground. Soon spouses left Kashanovka and went to children in Kharkiv, maybe forever. The most problem settlement in the region is the village Alexandrovka, that is near Popasnaya, which passed under the control of the Ukrainian army less than a year ago. There are neither water, nor light, but local people are still there. Nearly forty people. All of them are going to be evacuated as soon as possible. ‘It’s not Katerinovka, it’s real ‘grey zone’, the head of Popasnaya district state administration cuts short.